Дорогие российские читатели, Добро пожаловать в Эдем! I’m very pleased that my short story ‘Monsters’, first published in Interzone way back in 2003, will be appearing, in very distinguished company, in the Headland anthology, published by Edge Hill University Press to mark 10 years of the Edge Hill Prize. The Edge Hill Prize is the UK’s main prize for single author collections of stories (of any genre) and winning it for my collection, The Turing Test, was a huge breakthrough in my writing career. Although it’s not the story that people most often mention when they read The Turing Test, ‘Monsters’ is a personal favourite of mine, perhaps because, although autobiographical elements are present in almost all my fiction, they are particularly to the fore here in this story about how writers both use and are held back by their demons, and about a poet’s emotionally stifling relationship with his mother. Here’s the blurb about me and the story on the Edge Hill website. 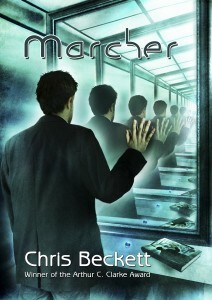 Just to let you know that the signed hardback edition of Marcher from Newcon Press, with its striking cover by Ben Baldwin, is currently on special offer here, along with a number of other publications from Ian Whates’ excellent imprint. I’m delighted to say that Presses de la Cité (who already publish the French version of DARK EDEN) have acquired French rights in MOTHER OF EDEN. 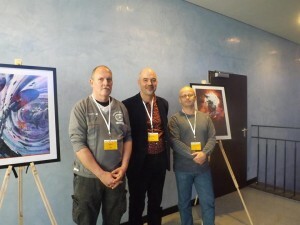 This is me at Dortcon, with the other guests of honour, artist Lothar Bauer on the left of the picture (a man of few words, who says his pictures speak for him: we are flanked by two of them here) and fellow SF writer Karsten Kruschel on the right. I know a huge amount of work and worry, over a long period of time, goes into planning these events, which most attendees (including me) don’t really see. What I see, and most attendees see, is a little peaceful island, where gentle and imaginative people can gather for a couple of days of conversation and friendship and playfulness. This was my first real visit to Germany. Fascinating listening to German spoken all around me. Perhaps because, from an early age, my sisters and I were cared for by German au pairs, I’ve always liked the sound of the language. I find it musical, where many English people find it harsh, and could quite happily just sit and listen to its cadences, even if I didn’t have someone to interpret. The tantalising thing about it is that, though I can’t understand it, it’s so obviously a close cousin of English that I can’t quite let go of the idea that, if only I tried hard enough, I could. It’s interesting how every country has its stories, its past events, it’s preoccupations, which it must keep going over and over, just as individuals have events in their own lives that they must visit and revisit over and over: the old DDR and what had happened to it when Germany was unified, for instance, was clearly one such topic, even more than twenty years on. My fellow writer and guest of honour Karsten grew up in the DDR. He told me all SF in the DDR had to depict a socialist future (so as not to violate the Marxist creed of the inevitable triumph of socialism). When he studied for a PhD thesis on dystopian literature, he had to have special permission to look at George Orwell’s 1984, which was held in the university library but was forbidden to the general public. He had to go to a special room to read it. Now to me, that sounds like a scene from an SF novel in itself. I’m delighted to say that Dark Eden will come out in French on April 2nd. 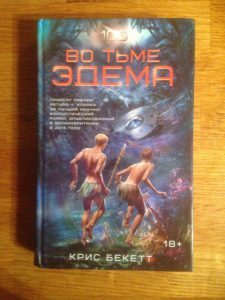 The book will retain the English title. 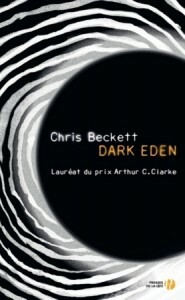 This is the rather striking French cover design, which I see as the dark planet Eden against the brightness of Starry Swirl. 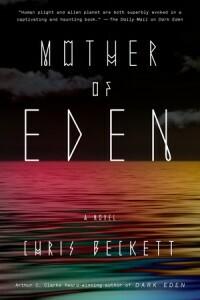 Here’s the cover for the US edition of Mother of Eden. The story is set on both sides of the sea which Eden people call Worldpool. A new story of mine, ‘Judgement’, appears in a new anthology, In the Empty Places, published as a fundraiser for the Bantuan Coffee Foundation, a charity which helps victims of child prostitution and trafficking in Indonesia and elsewhere. The story imagines what it would be like to discover that we lived in a world where the Protestant theological principle of sola fide was literally true, so that anyone who did not believe in Christ, regardless of their own conduct, really would be damned forever. It is terrifying to live under a brutal dictator who may torture and kill you if you dare to criticise him, but imagine living under an omnipotent and omniscient creator who is so incredibly cruel that, if you don’t believe in him, he won’t even let you die, preferring to have you tortured for all eternity! Others will have to judge how well the story works, but it certainly terrified me when I was writing it!